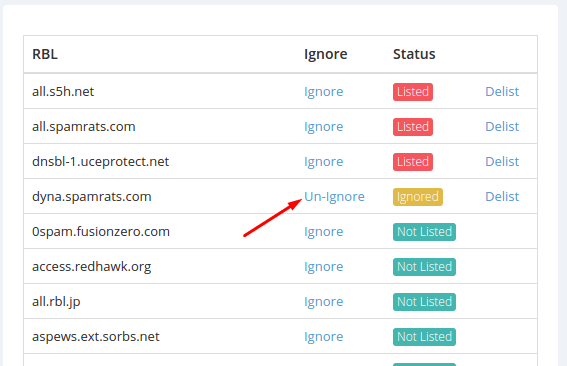 Considering the amount of IPs our clients monitor, we have designed the RBL Ignore system to be account wide, meaning that if you choose to ignore a blacklist, then that blacklist will be ignored for your entire account and all of your monitored IPs. On the report page you’ll find “Ignore” links next to each of the blacklist. 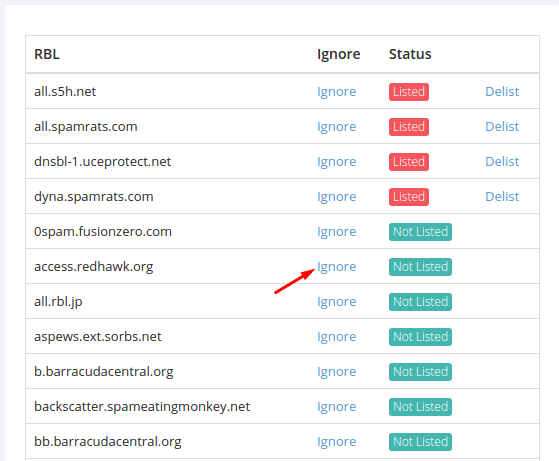 Once you ignore a blacklist, our system will not check it anymore when we scan your IPs against all of the blacklists. It’s also worth mentioning that if you choose to ignore a RBL that your IPs are currently listed on, you will receive a change notification during the next IP checkup, because our system will notice changes in your blacklist status, a.k.a. your IPs will not be listed on that RBL anymore (or so will it seem to our system if you choose to ignore that RBL). When ignoring a RBL, the changes don’t take full effect until our system runs the next checkup on your IPs. You can also Un-Ignore any RBL the same way you have ignored it, from any of your report pages. We’ve developed the RBL Ignore system because some blacklists are uncooperative or unresponsive, and some of our clients have requested to implement this feature, so they can choose to ignore certain RBLs.